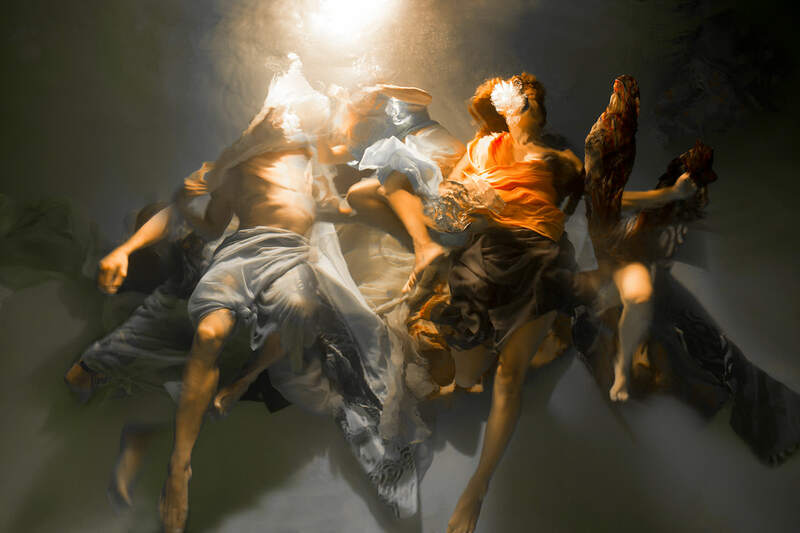 It’s so refreshing when you come across artwork that is so unique, so beautiful, and so inspiring as Christy Lee Rogers’ new collection, Muses. 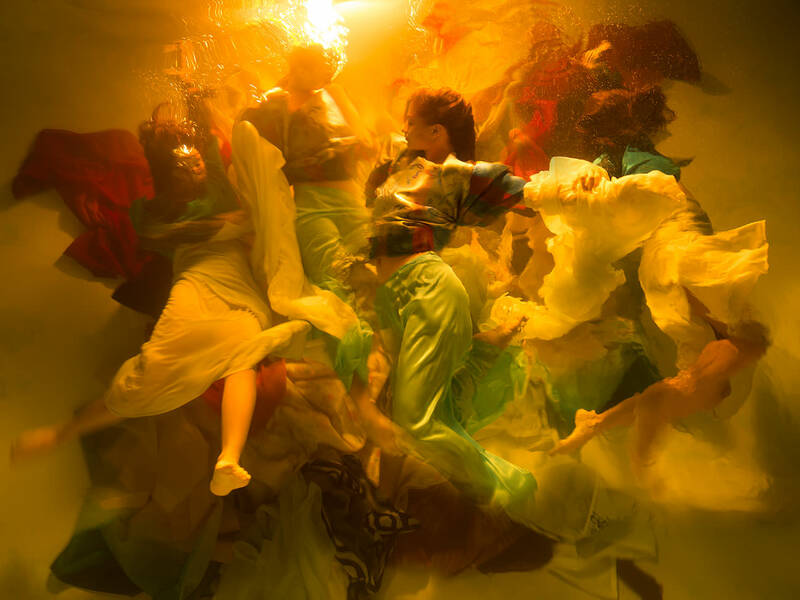 Using photography techniques that break all the rules, and literally throwing her models into the deep end during the shoot, Christy creates beautiful underwater landscapes reminiscent of Baroque paintings, with a contemporary twist. 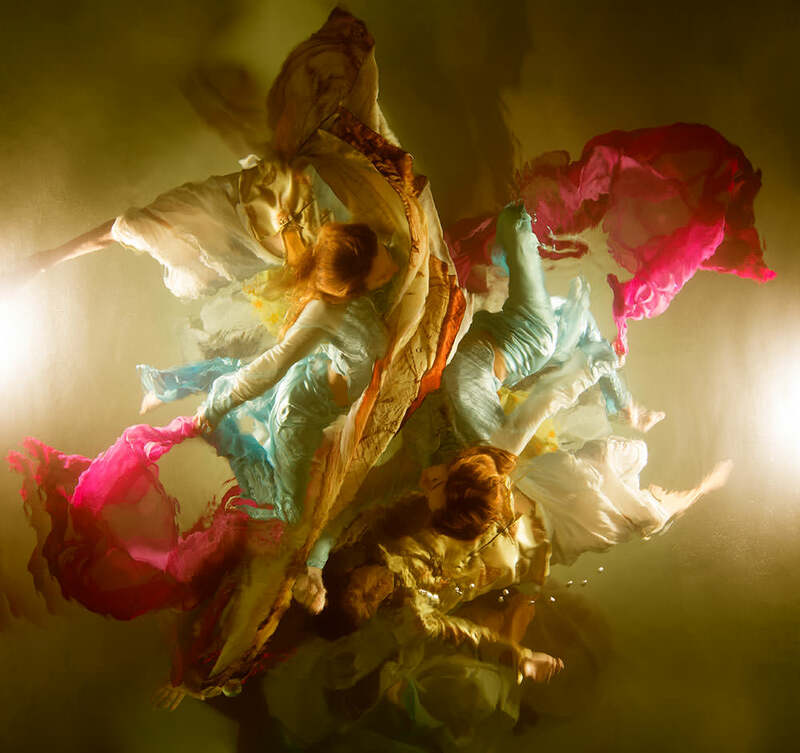 She’s been playing with water and refracted light in her photos for years; it is a style she has defined and mastered. 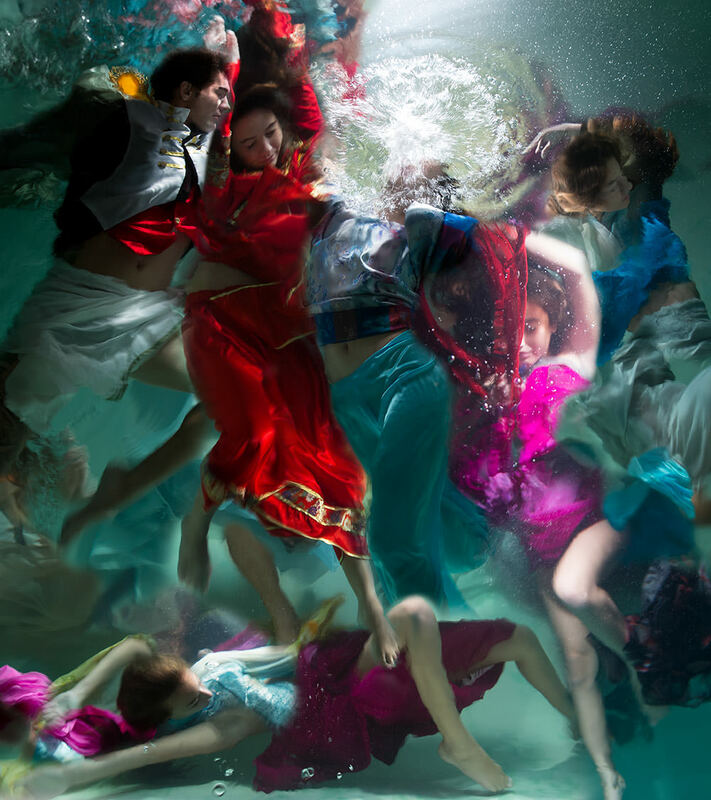 But recently, Christy’s new series, Muses, is getting massive international recognition for its unique style and captivating imagery. The collection, inspired by and dedicated to close friends and loved ones she recently lost, is being exhibited all over the world, including in the States, Mexico, and China. 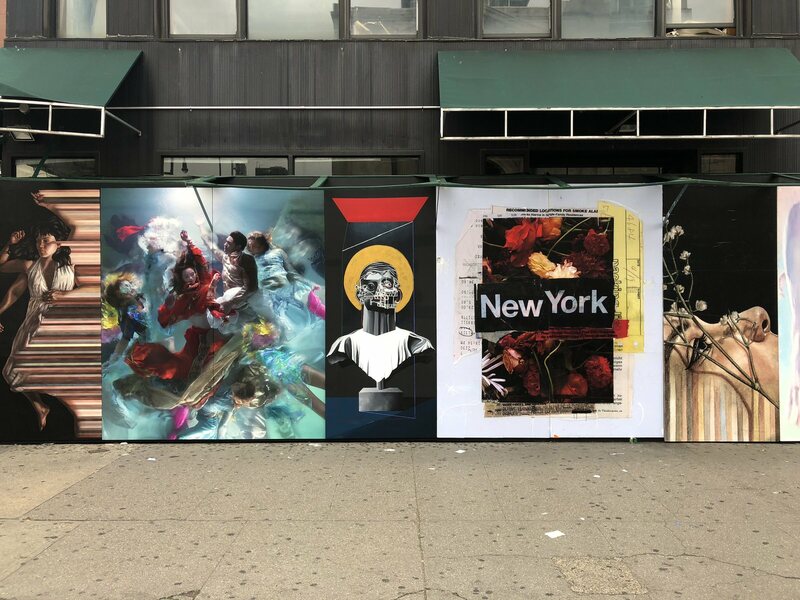 Christy also recently partnered with Bombay Sapphire for Art in Progress to create a NYC street art installation displayed on a building destined for demolition. I had the chance to talk to Christy about the installation, the inspiration behind Muses, and her unconventional shooting style. I just went to New York City to do an outside street installation for Bombay Sapphire. They contacted me to do a huge piece from the Muses collection. The installation’s on 14th and 8th Avenue in New York. It’ll be up for the weekend, and then the building that it’s on is going to be demolished. Their whole thing is about putting artwork up on all the construction sites to really make the city more beautiful. Right now, there are thousands of construction sites around New York City and the concept is to bring art to the city that way. 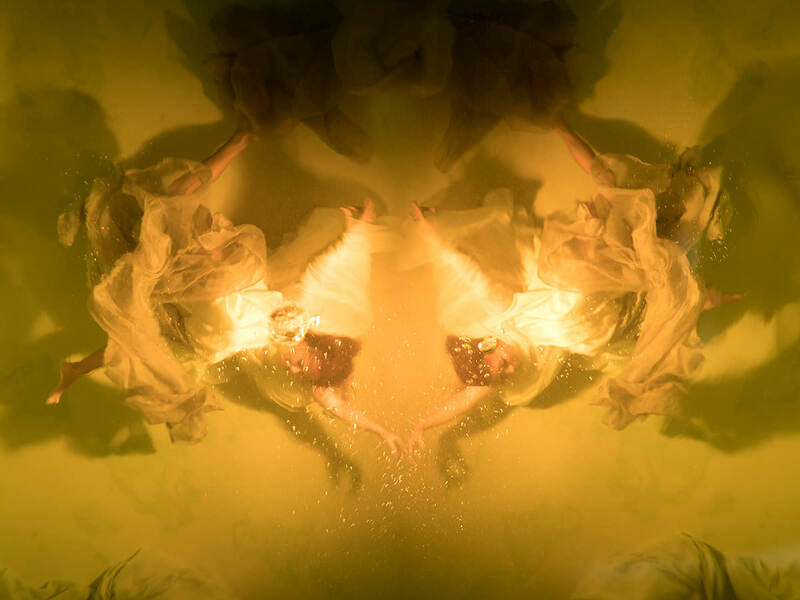 There are two new images from the Muses collection that I created for Bombay Sapphire. There’s one that’s up as the street art installation and the other is posted around the city as a signpost to the main exhibit. Let’s talk about the Muses collection, it’s brand new? Yeah. It started last year and the images are very important to me. I do a lot of writing and a lot of reading. I don’t just go out there and shoot randomly. So there will always be sort of a main thread through the series and a concept. This one was a little bit difficult because I had lost a lot of people in my life. And very young – two very good childhood friends, one 39 and one in her 40s, and I’ll tell you that really freaked me out. Besides just crying uncontrollably, I was like, “Well, you know, I’ve got to get this together because at some point, we all just leave; we all have to leave each other.” And so there was that concept in there, but I didn’t want it to be sad. I wanted it to be more hopeful. To find something that we all can connect to, it’s like this beautiful place that you can let go and be inspired. It’s hard to explain the concept in words, really, because it’s almost beyond words. I think that’s why I have to put them in images. I really feel that people get it without me even explaining that this is something higher than ourselves, you know, something beyond ourselves that’s more powerful. Or that it is ourselves, that we’re more powerful, but that we don’t tap into that all the time. We get lost in this reality of gotta go to work, gotta pay my taxes, gotta wake up, feed the body, all this stuff. And I wanted to get out of that and get back into this place where you could wake up in the morning and just be inspired. That’s why I called it Muses. Sometimes there’s this inspiration that just sort of hits you very fast and you tap into your real self. That was where it started. It’s just that lofty, beautiful, letting go kind of feeling. It’s something that they used to do in the Renaissance and the Baroque periods. I realize there was this passion and, I would say, this concept of something bigger than yourself that was apparent in the images. And it wasn’t about thinking, you know? That’s what gets me a lot, that people try to figure out the series or the work. They try to communicate about it in words instead of just feeling it. And that’s what I wanted, for these images to take you away from your own thoughts too, so you just feel something. You don’t know what it is, but you feel good. Do you think of it then as a tribute to the friends and loved ones that you lost? Yes, for sure. I actually dedicated one of the pieces called The Reunion of Catherine, Carrie, and Jean to the daughter who had just passed away. Her name was Catherine Kearns. And her mother had passed away a few years back from cancer and her younger sister from leukemia. So basically, all of the women of that family are gone. It was just too much. I know a lot of people are going through that these days, losing people to cancer. So, there was a dedication. The world created in the images was a place that I wanted them to go to be, to let go and where everything was beautiful, peaceful, and calm, with no negative thoughts, just nothing, just peace. 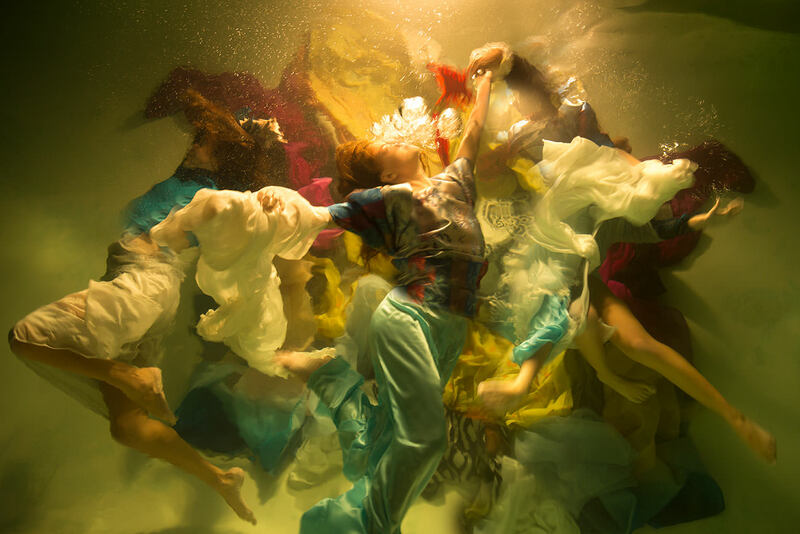 When you shoot, the models are actually in the water, fully submerged. This isn’t something new for you, you’ve been doing that for years. 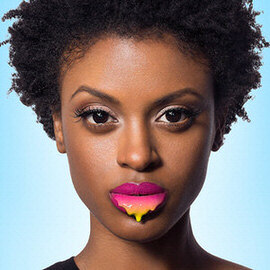 What was the inspiration behind it and how would you define your style? Well, I started this a very long time ago. 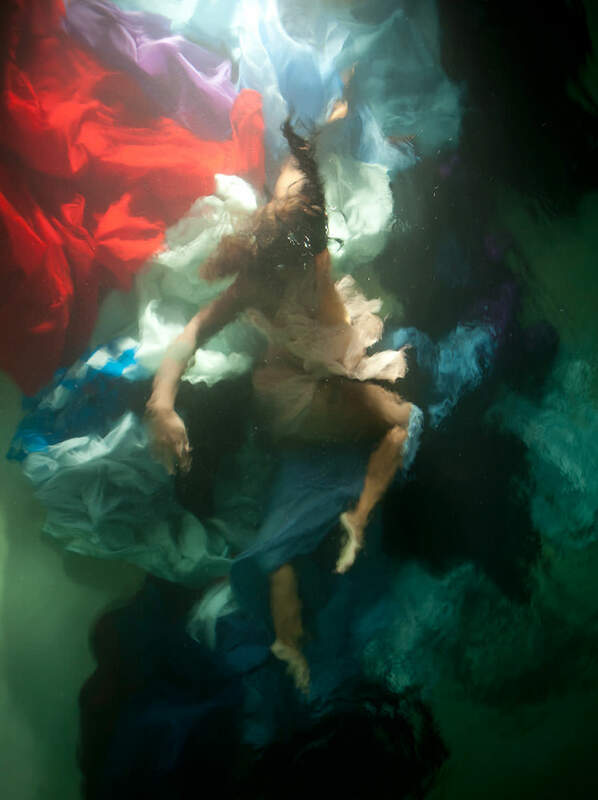 Jody Cosgrove-Kao, my friend who passed away, was my first model underwater. She was my best friend growing up in Kailua, Hawaii. She was an actress and anything I wanted, she would do. My first experimentations were with her, with video actually, and we did some photographs as well. We were both from Hawaii. It was just very natural to get into the water, and I did notice that there was something very magical about being in the water. It was like you stepped out of reality and things started to blur and blend. But this was a process, it was maybe 10 years of experimentation before I actually released my first image. It was sort of like a science project where I was bending and breaking the rules of photography. The lighting was all messed up, everything was messed up, but I was kind of like, “How far can I push to get the shot I like?” Then I started going outside of the water. So now I’m outside the water and the models are inside the water. I notice that when I do that, I get a different look because the light is traveling slower in the water than it is in the air, so you get a bending, you get refraction when you have these two different mediums and using my camera. I started to notice that I could sort of paint with my camera if I set it exactly right and put the light exactly where it needed to be, and the models moved exactly the way I needed. It’s a very precise technique. Although for me, it feels very natural now just because I’ve been doing it for so long. I know what’s going to work and what’s not going to work. I do have to push it because it’s very finicky. The water is very powerful and it just takes the models where it wants them to go, so the technique is very precise. And again, it’s just breaking a lot of the rules. My camera is constantly telling me that the light is not correct. And I’m not using any light meters, I’m really just going by eye on what I know works. That’s a good lesson for photographers who think that you have to follow every single rule. Yes, exactly. You just have to feel the images and you have to look. It’s all about looking. It’s really crazy because now, I’m sort of losing my eyesight when I read, and that’s been a real problem for me because I am using my eyes to know exactly what’s happening. So that’s going to be one of my next hurdles. I’m looking in this really small viewfinder in my camera, and I’m eventually going to have to move up to a new system where I have a larger image where I can tell if everything’s in focus, and everything’s working, the lighting is right. If you get the lighting just a little bit off, you’re just a little bit too dark, then the image doesn’t work. It’s got to pop. The colors really pop if that light is set correctly. And I’m shooting at night, too, so the key point in my technique is that the lighting is very sharp. Can you walk us through the process of a typical shoot? I love to go back to Hawaii to shoot. Usually, I’ll do one collection a year. It takes me a long time, so I might put out 20 to 30 images a year. I usually wait until Christmas when I’m going back to visit my family, and I’ll plan to make the shoot happen during that time. 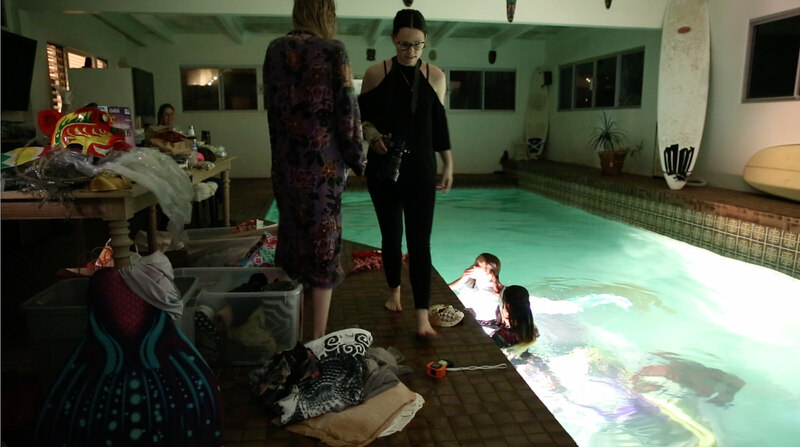 For Muses, I actually found a girl that had an indoor pool, and she ended up being in the images, too. My shoots are very casual; I don’t have a huge crew. I like to keep it very simple so that the models feel really comfortable with me and it’s almost like we’re just playing, we’re just having a good time. They’re not stressed, I’m not stressed, I don’t have any crew waiting for me, I can take my time, and we’ll just shoot all night. Usually, we’ll set it up where we have one night and we’re sort of practicing. I’ll spend a few hours with them, teaching them my style because I think it is a little bit different than what they expect. Then they start getting really good, so we’ll come back the next night and we’ll really just fine-tune. Sometimes, it’s interesting though with the models, the first night is their best night because I don’t tell them everything that’s going on. I want them to show up fresh and not to worry about anything. I want them to just be natural in the water. So I will tell them a little bit about how their bodies will be positioned and things they need to do right before the shoot. Then they get in and I fine-tune them. So we do one, I’ll say, “Okay, let’s try this, your legs need to go down,” and it’s just a fine tuning as we go, and they get better and better. It’s very difficult for them to be underwater the way I have them underwater. The water is going in your nose. It’s nighttime, so you really can’t see what’s going on. And I had their eyes closed. 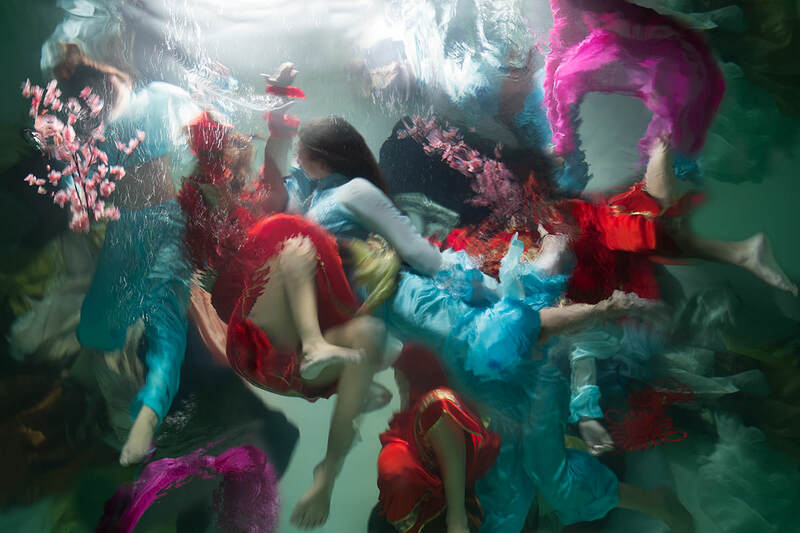 When you have four or five bodies in the water, all scrunched together, you start to get this chaotic water landscape. With these elaborate costumes and everything in there. Yeah, yeah. The fabrics are pulling them down, they’re getting tangled around different bodies, someone’s foot is in the other person’s face. But this is what I am looking for, it’s that vulnerability and that messiness that I want to push forward. That’s where the brilliant shots will come through, sometimes in the mistakes. With the lighting techniques, because you have this very apparent painterly style, are you using old lighting techniques from different eras? You know, I think I am, but it wasn’t anything I really planned. It just came in when I was experimenting. I realized, “Oh, this is what works.” Now I love lighting from the top, and letting it get really blown out, so it looks like they’re reaching up into this empty space up there or into something greater… the light. Who were some of your biggest influences? Had you ever seen anything like this before you started doing it? No, not really. I mean, I feel like when I first started, the only photographer I was really aware of that was doing it was Howard Schatz. I think I became aware of him after I started doing it. I don’t really pay attention too much to the news. I don’t have a television. My parents have to call me if there’s a storm coming my way. So I’m a little bit out of the loop. I made it a point to not pay attention because I wanted it to be really pure and natural. But, I would say some of my first influences were filmmakers, like Fellini was a huge influence on me when I was in college. Federico Fellini and Luke Besson. And music. Music is huge for me right now. It’s funny because when I was creating this collection, I was listening to Muse. I know that it sounds funny with this collection, but his lyrics are so incredible. 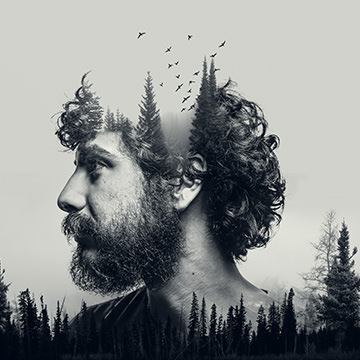 You’ll find a lot of the titles of my pieces connected to some of the lyrics. I am just blown away by their music, and the lyrics, and just the passion. It really inspired me. Do you have a favorite photo that you’ve shot? The Heart is a Lonely Hunter is one of my favorites. It’s a really popular one; it’s sold out. It’s funny, sometimes you think you can recreate something, but you really can’t. It’s a moment in time that can never be recreated. Somehow, the fabrics show up in a certain way and the models in a certain way. That would be one of my favorites. What’s your editing process like? Do you do a lot in post? For most of my collections, there has been no Photoshop. When I first started out, I would just get them onto the computer. I would use Photoshop to crop them, to look at them and prepare the files, but I was just leaving everything as is, even the lighting. You especially see that with Reckless Unbound, my third collection. And that was just because I didn’t know how to do Photoshop. I was making sure that I shot it correctly, so I wouldn’t have to do anything to them. But on the Hybrids collection, I had started taking photographs of my paintings and then layering in some of the paintings into my photographs. I started playing around a little bit and making mixed-media. 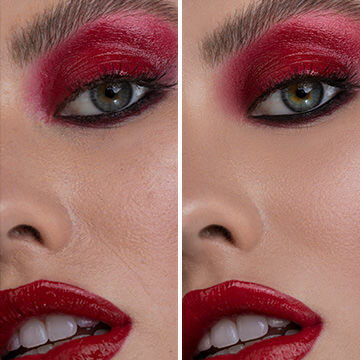 There are a couple of the long epic shoots where I literally just took two images and put them together, put a seam in the middle. That was a Photoshop technique and that’s something new for me. I’ve never done that before. It’s pretty incredible that you don’t need to do digital editing because it shows that, like you said before, it is a very precise process. To get it right in camera, that’s awesome. Is there a book that you love that you would recommend to other creative people? The Alchemist, it’s one of my favorites. I just finished reading that again. I get really inspired by movies. One of my favorite movies, I mean, besides Fellini, we’ve got to say Fellini, but more recently, is Interstellar. The concept of space and time in there is just mind-blowing to me. I like to play with that with my images, I want to take us to a timeless place where you don’t know where you are, you don’t know what year it is. 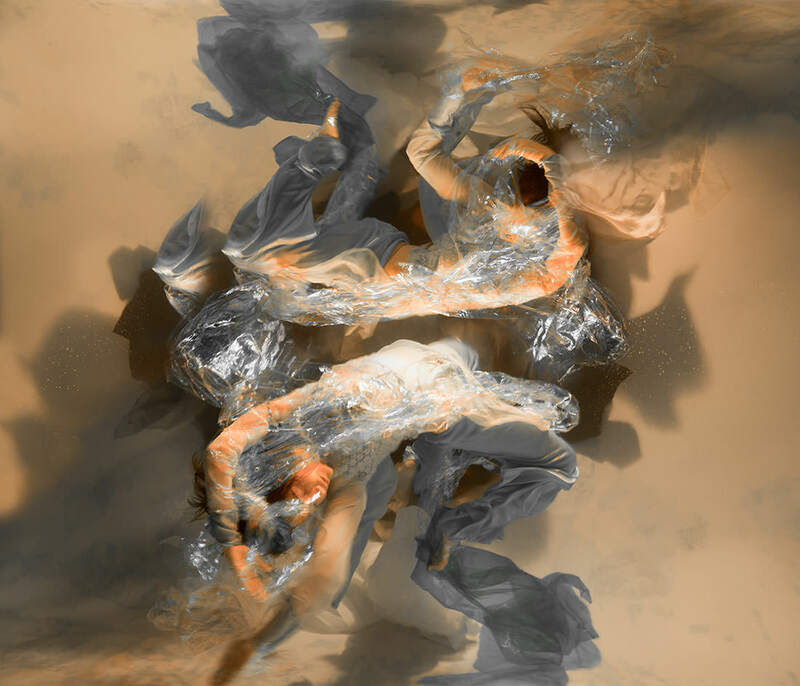 My images look very contemporary, yet they look very old and Baroque. You might see a tattoo on somebody or something that makes you look twice. You just wrapped up the show at the Art Labor Gallery and now you’re doing PHOTOFAIR Shanghai? Yeah. I’m not going to go out there because my son is four and a half years old and it’s so far. But, Shanghai is quite an incredible place. I do feel lucky being able to exhibit in China. Not very many U.S. artists get to exhibit there. That’s huge. Congratulations on the shows and everything that’s been happening. What’s next? Thank you. I have another show happening in Mexico City at Let There Be Art Gallery. That’s happening right now, too. It’s a solo show. Two new shows in the US early next year, some collaborations coming up and prepping for a new experimental shoot. Then there’s this thing called ArtPrize up in Michigan. There are about half a million people that come into Grand Rapids to see this and they give away $200,000. I have this piece that I dedicated to these three women that is on exhibit there and I’ll be donating money to their charities if it by chance wins. This is hard to put into words, but my heart goes out to mankind, with what we go through, the wars and the chaos, and what we go through psychologically. I hear about people having depression and I have my own baggage. I really feel for mankind and I guess I feel like I have a duty as an artist to try to uplift them, to bring back the hope when there’s just a lot of the darkness going on. I feel like every artist has that job. And I take it very seriously. I feel like I have to put something positive back into the world. That’s my goal. Forget about making money as an artist, that’s the true reward. To inspire someone. 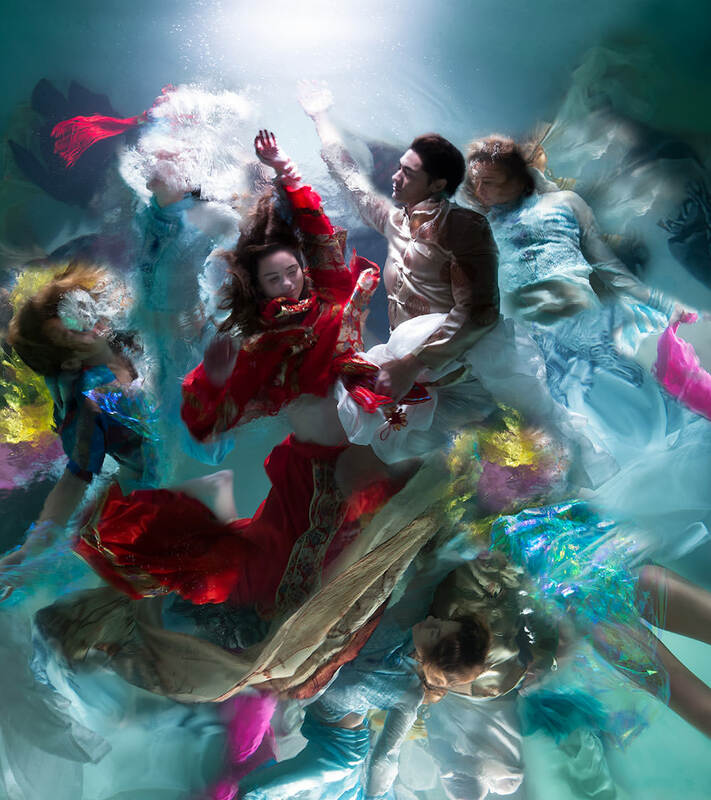 To see more of Christy’s beautiful underwater photography, visit her website, or follow her on Instagram, Facebook, and Behance.